On Saturday 1st Feb we’ll be hosting our first Open Hack Day. Since Hackspace began, we’ve held an Open Hack Night every Wednesday, to allow new members to visit the space, take a tour, and find out what great things we have on offer. If you’ve ever wanted to visit the space, or wondered what we do, this is a great way to find out. 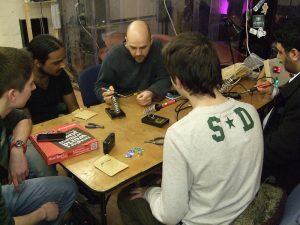 You will have an opportunity to meet Hackspace members, see the projects they are working on, and perhaps even get involved in some making yourself! We’ll be on hand all day to answer any questions, show you the ropes and keep the kettle boiling! This is a FREE event, we look forward to seeing you there!